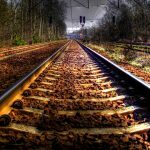 In the realm of predictive maintenance, IoT is mixing with machine learning to help keep railroads clear in the British autumn, improving safety and timing for commuters. Recently, I wrote about the use of IoT technologies to help predictively maintain the rail network. Low-cost sensors combined with machine learning are giving operators the ability to make increasingly intelligent decisions about network maintenance. So it’s interesting to see another project along these lines from a team at the University of Birmingham. The team is hoping to tackle the perennial blight of British railways that are leaves on the line. The project has resulted in a new technology being developed, which the team is calling AutumnSense. It involves low-cost sensors to monitor and measure the moisture levels on the track at thousands of sites throughout the rail network. This data is then connected to weather forecasts that can predict leaf-fall levels to allow rail staff to identify the areas where slushy leaves are likely to present a problem for operators. The team believes this could easily be combined with an automated response system whereby trains are sent out to treat the tracks before rush-hour starts. The project takes a similar approach to one previously taken by the team when developing a sensor-based system, called WinterSense, to monitor road temperatures to alert officials when grit needs to be applied. “One of the major issues with road and rail safety is that hazardous conditions are usually highly localized. For remedial actions to be efficient, and demonstrate ‘best value’ for the taxpayer, resources should be deployed where they are needed, rather than in a blanket fashion,” the researchers say. Both systems are currently in a trial period, with hopes that they will be available commercially next year. “Even though leaf loss and damp conditions can largely be predicted — and despite automated treatment trains working round the clock from October to December — a windy, rainy night still causes havoc for commuters. We have run an initial trial of AutumnSense on a stretch of London Underground tracks that are above ground, and are hoping to move quickly towards a fuller network wide trial,” they continue. While leaves on the line have become synonymous with a feeble excuse for poor punctuality among commuters, they do nonetheless present a significant challenge for the industry, both in terms of safety and punctuality. Relatively low-cost systems like this could therefore quickly prove their worth.